It’s not often, dare I suggest never, that our domestic pets invite the local native animals round for tea and biscuits, or conversely, that the hand of friendship is extended from the native animals to our pets. Possibly, it may be because the native animals are alert to the boisterous, energetic disposition of our dogs that’ll likely chase them to within an inch of their lives, and our cats that tend to take murder in broad daylight a little too literally. Whichever way you approach it, our pets and native animals don’t typically play nicely together. No wonder our parks, bushland and National Parks are often restricted venues. However, that’s not always the case. 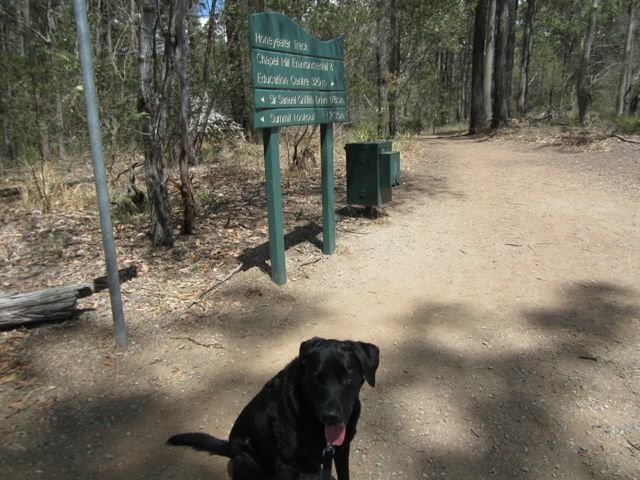 In suburbs nestled within precious natural bushland, walking tracks, which allow leashed dogs to accompany their people for a leisurely, or vigorous, as the case may be, walk through the bush do exist. One such locality is Mt Coot-tha Forest in Chapel Hill. This forest is expansive stretching many suburbs, with two pockets within Chapel Hill alone. The area of focus for this article sits within Fleming Roads and Marmindie and Nankoor Streets. Tracks are accessible from Marmindie and Nankoor Streets to the east, and Fleming Road from the south and west. 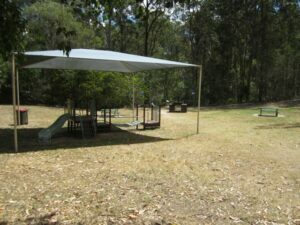 The Marmindie and Nankoor Street entrance sits at the rear of a family-friendly park, complete with swings, a playground and a picnic table. Fleming Road extends across the bottom of the forest, where The Hut Environmental Centre, picnic tables and a large carpark are located, as well as around the corner, hence the south and west, where another smaller carpark can be found parallel to Greenford Street. Each entry is clearly signed stipulating that dogs must be kept on leash, on the path and cleaned up after. Poo bins, amply supplied with poo bags, are also provided at all of the entries. The walks are generally short but can be extended if one is partial to tackling the hill, or mountain as it prefers to be known, to visit the lookout or to traverse one of the many other tracks within the Forest. occasionally see many birds during our travels but are yet to encounter any reptiles, (which suits me just fine) or mammals. I’d like to think that’s because they are taking a nap and not because they are petrified of my furry pacesetter. 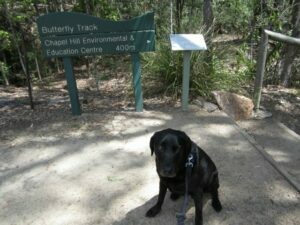 Regardless of what the native animals are up too I am mindful that we’ve dropped by their place and as such need to be respectful of their needs; a poo bag with droppings inside, where appropriate, and a leash is little to ask, given the incredibly beautiful, delightfully scented and invigorating place they call home.